With the detoxifying spices & herbs of turmeric, ginger, cayenne, rosemary & fennel it complements & augments the detoxifying process & is an excellent addition to the journey towards optimum health. 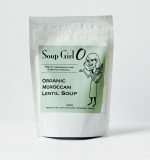 Featuring certified organic lentils, peas & rice. Infused with cinnamon, cumin, parsley and mint, this Moroccan-inspired soup is fragrant and flavourful! 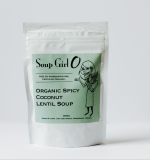 Featuring certified organic lentils and millet. 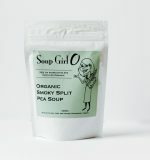 Boasting the smoky and fragrant flavours of smoked paprika, oregano and chipotle, this soup is Southwestern smokin’! Featuring certified organic peas and rice. The sweet aromatic notes of cinnamon, clove and coconut combine with chili pepper to give a delicious balance of sweet and heat. Featuring certified organic lentils and rice. 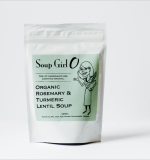 Sign Up To Receive Soup Girl's Newsletter!